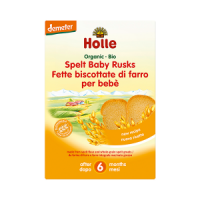 Suitale from 12 months of age until the end of the third year of life as part of a mixed diet of bottle feeds and weaning, Holle Organic Infant Goat Milk Follow-on Formula 3 milk can be used after using the Holle Organic Infant Goat Milk Follow-on Formula 2. At 12 months, your tiny baby has become a lively, inquisitive toddler. They're growing up quickly, they're learning about the world and they're very active! To support them in this important phase of their development, they need the best possible nutrition. 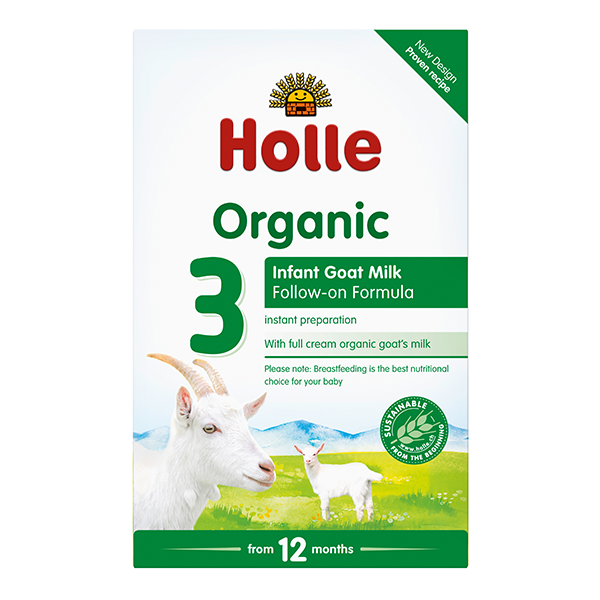 Holle Organic Infant Goat Milk Follow-on Formula 3 is organic, free from additives and full of goodness. It is made using organic goat's milk plus vitamins and minerals (which are required by law). The goats are cared for in accordance with organic farming regulations (EU organic law). Should a child have an allergic reaction to cow's milk, he or she may be able to tolerate goat's milk as an alternative. Goat's milk can, however, also cause allergies since some of the protein structures contained in cow's and goat's milk are the same. Key here is which protein the child has an allergic reaction to. This should, in all cases, be diagnosed by a doctor in order to clarify whether Holle Organic Infant Goat Milk Follow-On Formula 3 is a suitable alternative for your child. Infant Goat Milk Follow-On Formula 3 is 100% free from gluten, wheat, soya and has no added sugar, fish oil or GM ingredients. It's easy for your baby to digest - and it tastes great too! 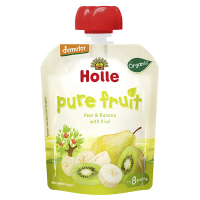 Holle organic baby milks and infant formula are now CO2 neutral. I give my daughter when she was 6 month and she is 14 month now and she never got problem drinking holle goat’s milk since then. It got no smell and taste so much, she’s not a fussy baby so she don’t mind about the taste as it doesn’t have any taste as it’s just plain. (Like bf milk a little bit sweet). I like it because I drink goat’s milk aswell and it’s good for digestion. So I try to look for something similar for my daughter. Excellent seller! Very fast delivery,really happy with this product,my baby loves it! Thank you! Quick delivery, super clear website and transaction. I’ll definitely use Ulula again. Absolutely love this milk, we have tried so many different milks to try suit my son as he suffers with slight eczema from cows milk and this is perfect and affordable. We have had no issues with eczema coming up since starting this milk and knowing it’s organic makes it even better. Highly recommend! It was great to have so many boxes of the follow on goat’s milk as my daughter loves it and gets through loads! Very satisfied with the quality of this formula milk. It's easy to digest and my baby has much better nights of sleep. Really recommend I was expecting not nice smell but was so nice also my boy liked the flavour of milk. My toddler loves this formula. I also trust this product and believe it to be the best formula available. I wouldn't buy anything else. After a lot of research, my wife had decided this was the best non-cow milk based formula to use for our son. He loves it as well, so that helps!